Mar Paul Chittilapally was born to Chummar and Kunjai at Mattam in the eparchy fo Trichur on Febuary 7, 1934, He did his school studies at St. Francis High School Mattam. Having passed intermediate from S.H. College, Thevara in 1953, he joined St. Mary’s Minor Seminary, Trichur. He did his Studies in philosophy at St. Joseph’s Pontifical Seminary, Alwaye. He was then sent for theological studies to the Pontifical Urban University, Rome (1958-1962) from where he secured licentiate in theology. He was ordained priest for the diocese of Trichur on October 18, 1961 in Rome by Mar Mathew Kavukatt, the then Archbishop of Changanassery. He continued his studies in Lateran University, Rome and took doctorate in Canon Law in 1966. During the period from 1962 to 1966, he also served as father prefect to the Malabar Community in San Josephat College, Rome. Back in the eparchy he was first appointed assistant parish priest at Aloor and Vellanchira. From 1967 to 1971, he was professor of theology and Canon Law at St. Thomas Apostolic Seminary, Kottyam. From 1971 to 1980, he was the chancellor of the Eparchy of Trichur. In 1978, he was appointed Protosyncellus and Judicial Vicar. At the same time he served also as manager of St. Thomas College. In 1987, he was appointed Chaplain to Syro-Malabar Catholics and General Director of K.C.A. in Bombay. On April 30, 1988, he was nominated Bishop of Kalyan and was ordained Bishop on august 24, 1988 by Antony Cardinal Padiyara. 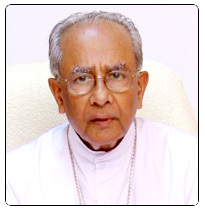 On November 11, 1996 he was appointed Bishop of Thamarassery and took charge of his office on February 13, 1997. At present he is a member of the Standing committee CBCI, member of the Permanent Synod, Chairman for the commission of Particular Laws, Member of Superior Tribunal of Syro-Malabar Synod and Chairman, KCBC commission for family, Laity & Women.